We are in the final few miles of a ride from Lancaster to Kendal and there’s a hill in the way. But what a fine hill. Kendal Castle, at the top of this grassy bank, is a fittingly grand end to our big day out. We have freewheeled through South Lakeland villages, taken tea in topiary gardens, and are now working up an appetite for dinner as sunset makes the rooftops of Kendal blush. 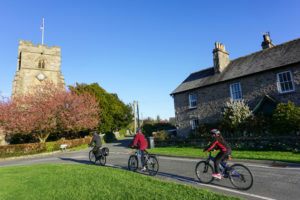 There are lots of routes that go through or near Kendal, and many are on quiet roads or cycle paths. Take a ride out to Windermere on National Cycle Route 6 or do the South Lakes Loop. One year we cycled The Lake District in the shape of a heart for two days, starting and ending at Newby Bridge. That’s how much we love biking it. You might be surprised to find you can ski in Kendal. In fact there’s a thriving Snow Sports Club and all weather slope. 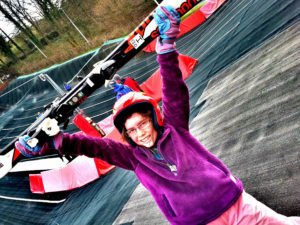 All visitors are welcome to try out the volunteer run slope in special taster sessions. 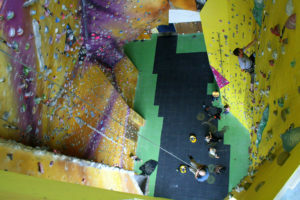 You can then choose whether to join the club with the cost of session and equipment hire knocked off your membership fee. We signed up before last year’s ski holiday and in one move improved our skiing, our fitness and our Sunday mornings. You can ski gently or have a go at steeper sections and there are moguls too. At 80 metres high, you won’t see an iconic peak from the top, but you may well see some improvement in your ski legs. For an iconic view you should head upwards through town to High Tenterfell where Kendal Golf Club shapes nature into a rich carpet of green. 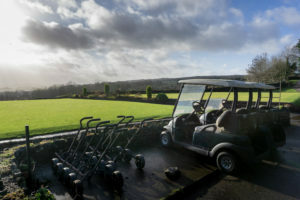 Visiting handicap golfers can enjoy the character and quirks of this century-old course which looks out onto the Lake District, the Yorkshire Dales and Morecambe Bay. If your swing is less developed head for Kendal Putting at Gooseholme. This 18 hole putting green has one of the longest established leagues worldwide and is mentioned in The Guinness Book of Records. If you prefer some intense practice, Kendal Golf Driving Range on Oxenholme Road, offers floodlit covered bays and tuition by arrangement. The River Kent is definitely not for beginners so if you have a family of novices you’re best advised to head for the still waters of Derwentwater or another of the lakes. But if your skills are up to handling moving water at grade two or three, you’ll find it a lively river to journey on. The Upper and Lower Kent sections of the river are difficult, especially if water levels are high, although you can inspect and walk round the hardest parts. The middle section from Burneside to Kendal is the easiest, although you must watch out for the weir in Kendal which you should portage around. Once in the town there are some fun waves to play on before the river heads down towards the challenges of the Lower Kent and Force Falls. Do remember to check access agreements and river levels before paddling.